Healthy communities are a core aim of the San Diego County Promotores Coalition. Healthy communities are those with the expertise and knowledge to access health services and resources creating a community conducive to health. This year’s conference focuses on the unification of Promotores and Community Health Workers (CHWs) in creating and maintaining healthy communities. How do we create healthy communities? Invest in Promotores and CHWs. Promotores and CHWs are effective in educating and linking community members to health resources and services. To create healthy communities we must create health systems that look beyond the clinic, reach individuals where they are in a way that is culturally competent to overcome barriers preventing communities from reaching their full health potential. 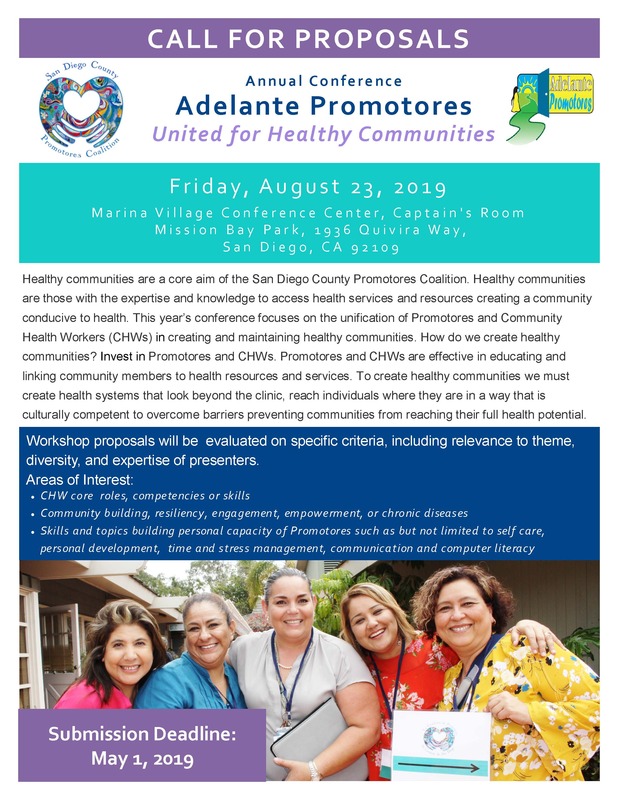 The Adelante Promotores Conference has three types of workshops: 1) Professional Development, 2) Health-related Topics and 3) Personal Development. Both professional and personal development workshop sessions are one and a half hours (90 minutes). The Health-related Topic workshop session is one hour (60 minutes.) The professional development session educates and updates Promotores on core roles and skills. Refer to the C3 report pages 37-40 for more details. Health-related Topic session focuses on increasing the knowledge of Promotores on relevant health-related topics to their San Diego communities, such as mental health, nutrition, chronic diseases, and others. Finally, the personal development session is aimed at developing capacity and skills of Promotores to deal with the needs of their Promotor work. When submitting a workshop proposal, keep in mind that the audience of the Adelante Promotores Conference is largely Latinx and prefer Spanish workshops. However, many are bilingual and some are monolingual English speakers. Workshops with captivating titles and descriptions are better attended relative to those with generic content. Lastly, interactive, discussion based workshops are encouraged and well received by the attendees.